Ranked near the bottom of the 32 teams on the field in South Africa, facing odds estimated at 400-to-1  and four straight pre-tournament losses to boot, Japan was not even expected to win a game in this year's World Cup, let alone advance to the knock-out round. How quickly perceptions change. With a convincing 3-1 victory  over the favoured Danish team on Thursday, Japan has earned itself a place behind Holland in Group E, advancing to the next round for only the second time in World Cup history and the first time on foreign soil. A mesmerizing 35-meter free kick  by rising star Keisuke Honda  gave Japan their lead in the 17th minute, followed in quick succession with another  by free-kick specialist Yasuhito Endo  from 25 meters out in the 30th minute. The Danes never managed to recover from the early assault, and the game ended with Japanese maintaining a comfortable two goal lead. On the ground in South Africa. A stadium at nightfall. Piercing the green of the field, the deep blue uniforms shine like the summer sky. The flags on their chests glitter with the red of the rising sun. The red of daybreak. Even now, as I write this, the excitement of the game is so strong that my heart still pounds, my hands still shake. In Japan, a new day has already begun. The sun has swept away the darkness that clouded Japanese soccer, and the sunlight proclaims the start of a new day. At around 7 o'clock, this sun will come round to South Africa and shine down brightly on our players over there. The Rising Sun. With courage and pride, the Japan team has advanced to the next round, as one of the best 16 teams in the World Cup. Japan needed only a tie in the match against Denmark to advance. The game between Holland and Cameroon, which took place at the same time in a different place, had no chance of impacting the final standings, so all the world's eyes were no doubt on the Japan-Denmark match. By achieving such an impressive result on the world stage, the Japanese team has overturned all expectations. A decisive 3-1 win. An amazing and beautiful victory. Keisuke Honda's no-spin free kick, the gentle curve of Yasuhito Endo's free kick, the Honda-Okazaki combination, cutting through Denmark's defence to guarantee the win. Japan overwhelmed Denmark. They could have advanced with a 0-0 tie, but this game was different: Japan put everything they had into it, leaving no room for claims that the win was a “fluke”, that they were “lucky” or that their opponent was “weak”. Japan was bound to win, clinch one of the top positions in its group, and advance. With this win, fans around the world, as well as those in Japan, have witnessed the true power of this Japanese team. Behind the scenes, there was another story  [ja] to Japan's success thus far in the World Cup. 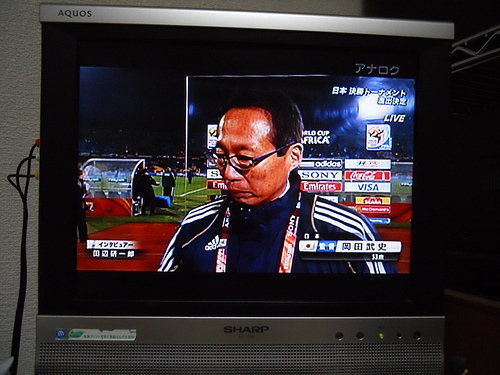 Among the record-setting 3,283 tweets-per-second flooding the microblogging service  during the Japan-Denmark game, many were expressing apologies to one person : coach Takeshi Okada , who had been the target of fierce domestic and international criticism  leading up to the World Cup tournament, most famously from former Japan coach Philippe Troussier, who lamented Okada's “stupid mentality” . With the Denmark win, all at once the critics were silenced . A new hashtag, “#okachan_sorry “, was even created by Japanese fans to express their apologies to the coach for doubting his leadership abilities . Prior to the start of the World Cup, many derided Okada's stated goal to get his team to the World Cup semi-finals  just like the South Koreans did in 2002. But attitudes have changed, and expectations have too. That means that more attention than ever will be focused on the Tuesday night match against Paraguay , where many Japanese — and their team's players  — believe their team will win. Should that not happen, some are already looking further ahead. Anybody up for a World Cup in Tokyo ?